Are you looking to start a health blog and need to get up and running? Look no further! This comprehensive guide to starting a website for your health blog will take you through the entire process – one step at a time. I hope that by following these simple steps you can get your own website up, so you can start creating great content to share with others while sharing your passion for health and wellness. Part One: Why do you need a website for your health blog? 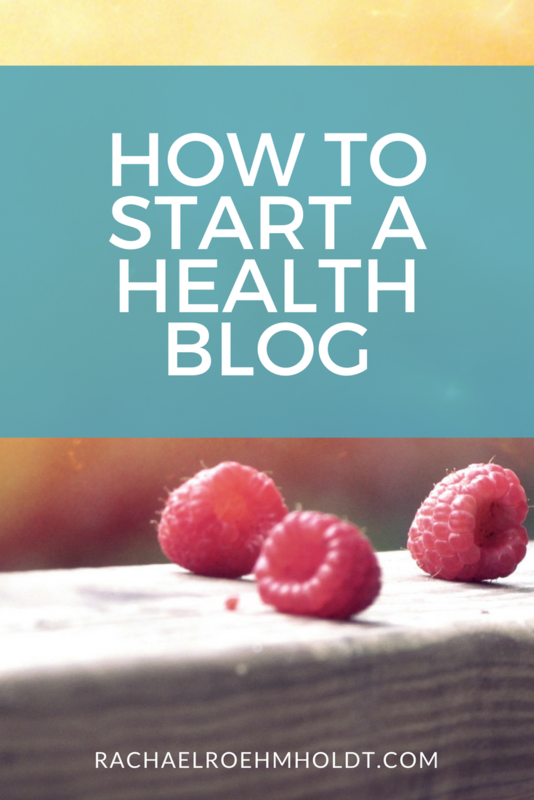 Part Two: What do you need to get started with a health blog? Part Three: Which website platform should you choose? Part Six: Want to take the next step? When you’re starting up a health blog, one of the first things you’re going to think about is your website. After all, if you’re going to be writing and sharing your thoughts online, you’ll want a place to call your own online. Your website is your “street address” in the online world – and a place to tell people where to go to read what you have to say. People put a LOT of emphasis on getting a website set up while launching their blogs. Like I said, your website is an important part of your online presence and gives people a first impression on whether they want to come back and visit your site again. I firmly believe that having a great website can help get you loyal fansand readers. With a website of your own that “hosts” your blog, you can stand out from the crowd of those folks who rely on other blogging platforms for readers and engagement. With your own website and domain, people can get to know you, trust your expertise, and learn to love you. The guts to take action! Don’t worry – I’m going over all the different parts of this in depth inside this resource page. Scroll down to get the details of what to do and how to make decisions on which service is right for you and your health blog. There are many options for website platforms for your blog these days – they range from completely done-for-you and out-of-the-box to 100% customizable. It’s up to you to decide what works for you and your level of comfort around the technology – plus what you’re willing to learn. What do you plan to share on your website? Will you blog? Will there be an online shop? Do you think you’ll want any fancy layouts? How often will you want to update your site as your blog and readershipgrows? It may be easier to learn to use one service inside and out NOW instead of learning how to use a few services as you upgrade and build your business over time. I have personally only ever used WordPress. Many people don’t start with WordPress, because there is quite a learning curve, but I knew that eventually I would wind up using the service because I knew most of the pros use it. If I was planning to spend time learning how to run my website, I was going to do it once – and once only. For the sake of walking you through exactly what I did to start my online business Im going to show you how I set up my website using WordPress. 1. Choose a domain name. When it comes to brainstorming a domain name for your health blog, there are a few simple steps to follow, but your creativity will really help you out while you’re going through this exercise. Brainstorm as many names as you can think of. Think about what is relevant to what you do and what you plan to blog about (and no, your blog name and domain do not have to be the same). Do a trademark search on the name. You can easily do this using this trademark search tool. Look up domain names on domize.com to see if your top choices are available. If they aren’t, you can look on sites like leandomainsearch.com to help you discover available domains that use keywords you’re interested in using until you find something that suits your business. Before locking in your domain for good, double check the relevant social media profile availability. You can use a tool like namecheckr.com or knowem.com. Make sure the domain name ideas you’re coming up with aren’t too long. Short and sweet but to the point is best, because it will be the most memorable. Make your domain name easy to spell if you have a purposely misspelled word in your domain, always be prepared to lose some traffic to those who don’t remember that its spelled differently. Things like Cutting Edge vs Kutting Edge people get very confused very easily. Make it easy on them and be easy to find. Pick something that makes sense with your blog topic…or don’t. People tend to flock to blogs where it’s obvious what they share in the name like Quinoa Recipes or Paleo Treats. But the opposite can be true and be a great idea because people remember you like Google or Bing they don’t make sense, but people still flock to them because they’re memorable. 2. 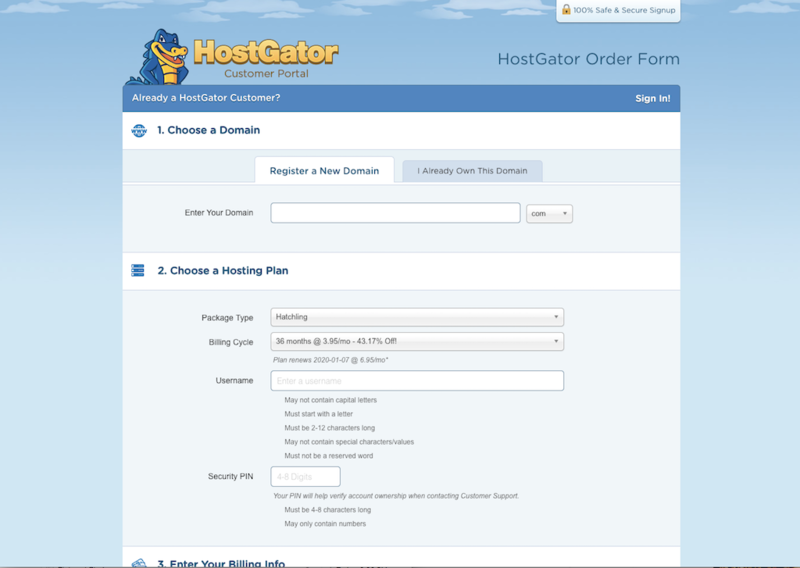 Sign up for Hostgator. 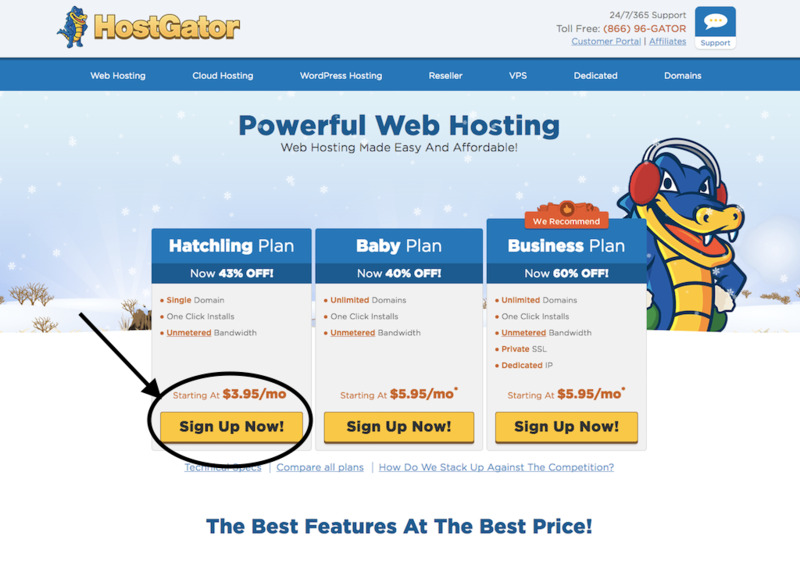 Once you know the domain you’d like to claim and know it’s available, hop on over to HostGator.com to get your domain and hosting set up. I am a HostGator affiliate and get a commission when you use my links to sign up. 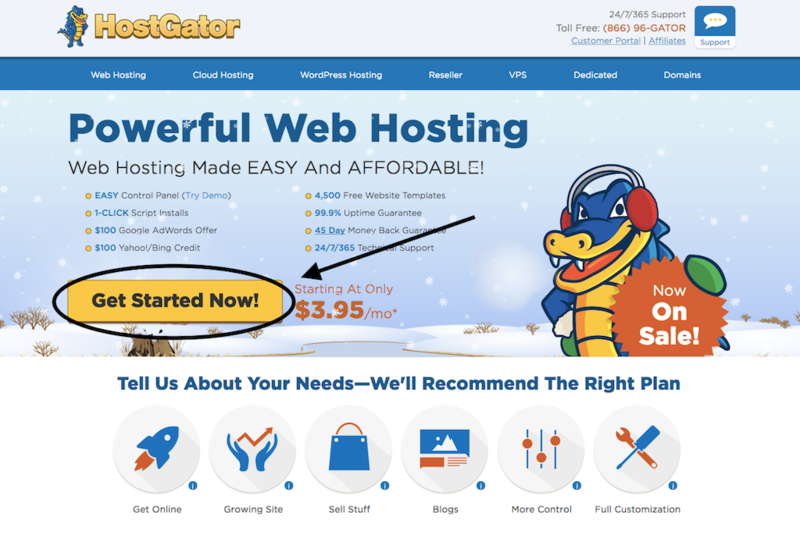 I love promoting HostGator, because they provide a great service, customer support is excellent, and the cherry on top is that their prices are amazing for small business owners who are just getting started. Click Get Started Now button. Plans start at under $5 per month! For a limited time, plans start at just $3/month and include a domain, web hosting, and unlimited email! CLICK HERE TO GET IN ON THIS EXCLUSIVE DEAL! On this screen, you’ll enter in the domain name that you want for your online business website. Once you enter an available domain name, you’ll see its available and it will be automatically added to your cart. If you’ve done your homework in step one, you should have no problems getting the domain you want. If you didn’t do your research on what is available, you might have to try a few different ideas before you get a domain name that you’re happy with. Next, you’ll see an option to add the .net and the .org versions of your domain. I don’t do this for my own websites and you really don’t need to. You’ll also see a checkbox option for Domain Privacy Protection. Keep this option checked as it will prevent your registration information from being publicly available. This will keep your private information like email address, phone number and physical address from becoming public information to anyone who is looking for the owner of the domain. Instead of your information being listed, HostGator’s information will be listed instead. 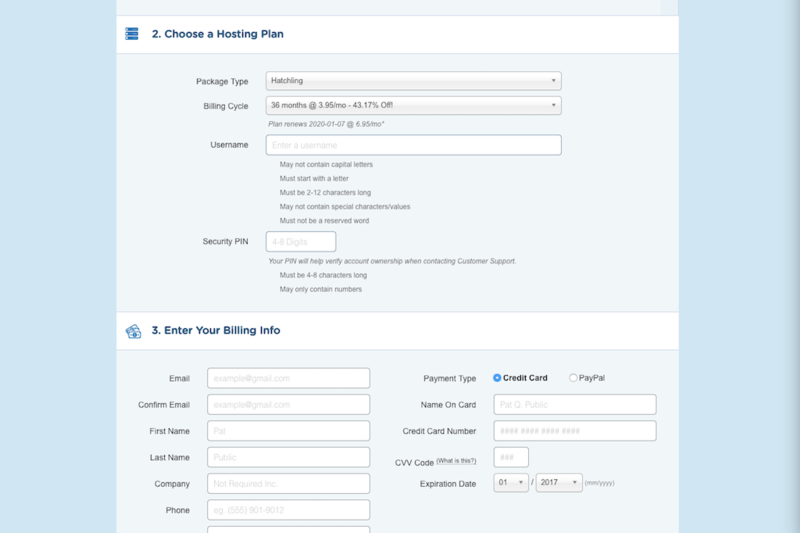 Confirm your hosting package and billing cycle length then create a username and password that you’ll remember. Scroll down and enter your billing information. You can trust that their site is 100% secure. This is also a good point to mention that HostGator has excellent customer support, so if you get stuck at any point during this process, you can hop on the phone and call them directly at 1-866-96-GATOR or click the live chat button on the top right of their page. They’ll get your questions answered asap and you’ll be on your way! Scroll down further on the page and you’ll be able to review your order in full. Review everything – then click Create Your Account! Hurray!! You’re set up with hosting and a brand new domain! 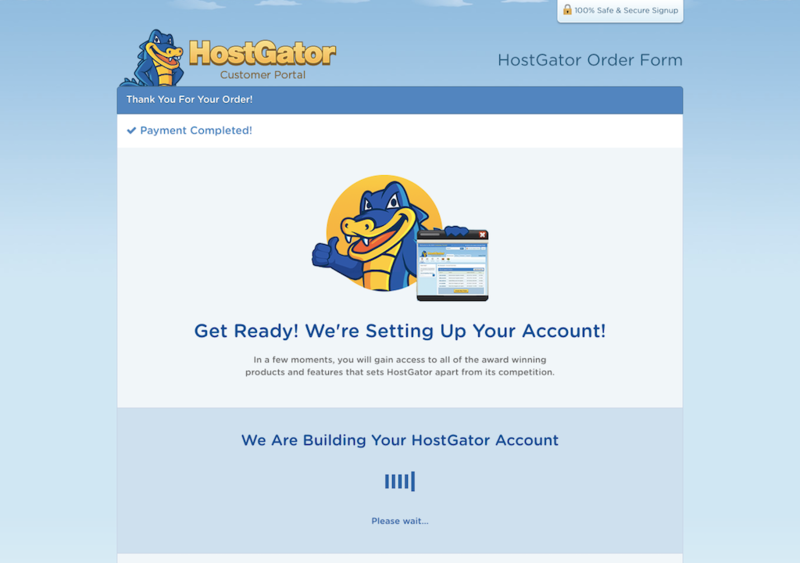 Within a few minutes of completing your payment with HostGator, you’ll get an email to confirm your purchase and contain some important information. Be sure to save this email for future reference! Inside the email, you’ll find a link to your Control Panel (or your cpanel) and your new username and password details. Click that link to take you to the Control Panel. 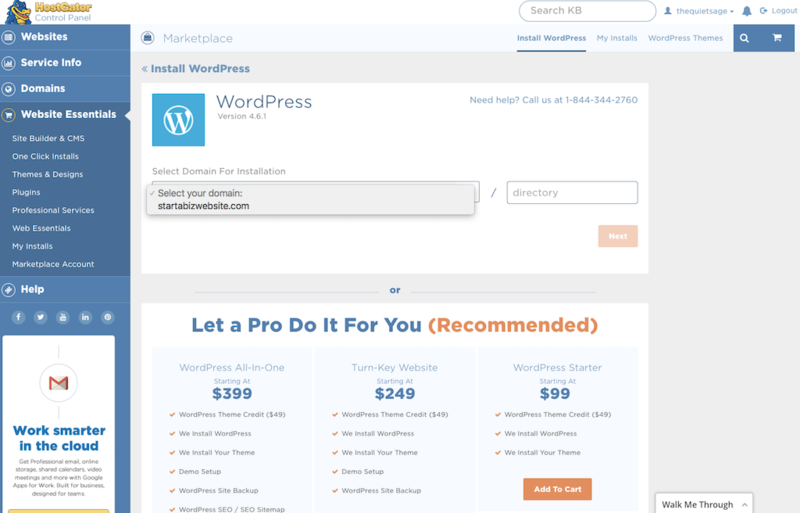 This is where you’ll set all the technical details up for how your new WordPress site. Now its time to install WordPress! 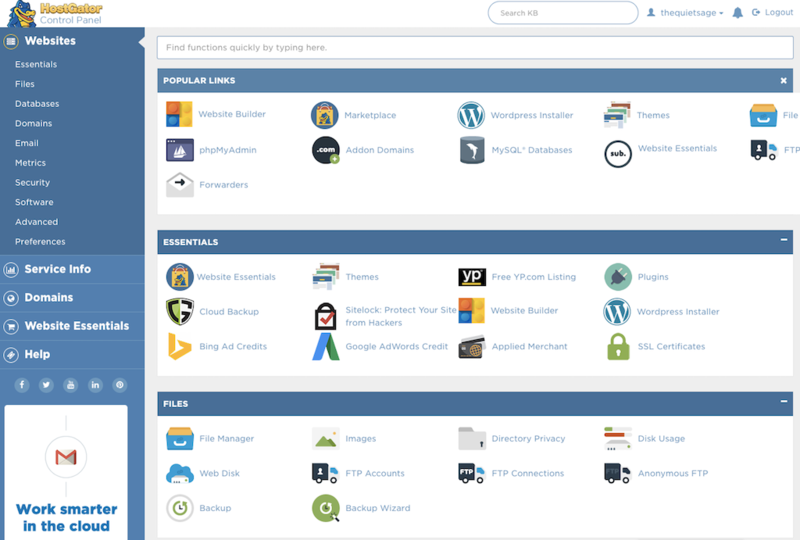 Luckily, HostGator has an amazingly easy QuickInstall for WordPress – so this process is a BREEZE to get set up and configured. Choose your domain, then click Next. On this next page, you can fill in your details of your Blog Title, Admin User, First and Last Name, and the Admin Email you want to use for your website. Be sure to check the Terms of Service Agreement before clicking Install Now. Your WordPress Install is done! Hurray! Be sure to note your login information and your temporary password before you close out the page. Note: While most websites will be accessible right away, it may take up to 48 hours. If it takes longer than 48 hours, don’t be shy on reaching out to HostGator chat support to ask about the progress. Once you can login, you’ll see your WordPress dashboard. On the lefthand side, look for Appearance, then click Themes to browse and select any of the WordPress themes that you can use for free. Posts: Where you can add new blog posts for your WordPress blog. Media: This is where all your images and any uploaded documents will live or be hosted on your website. Pages: These are the static pages that are on your website, like your HomePage, About Page, etc. Scroll down to see my full list of must-have pages for starting a new website. Comments: All blog comments will be here and you will see a little red circle with a number inside when you have comments that need to be moderated. Appearance: This is where you can choose a theme, select and manage your widgets for your sidebar, and your menu navigation for your website. Plugins: This is where you can add or update plugins to customize your website and make it run more smoothly. All these are completely optional and up to you to maintain, so choose wisely what you add – and dont add too many plugins or it could slow your site speed down. 4. Choose a free theme or purchase a premium WordPress theme. 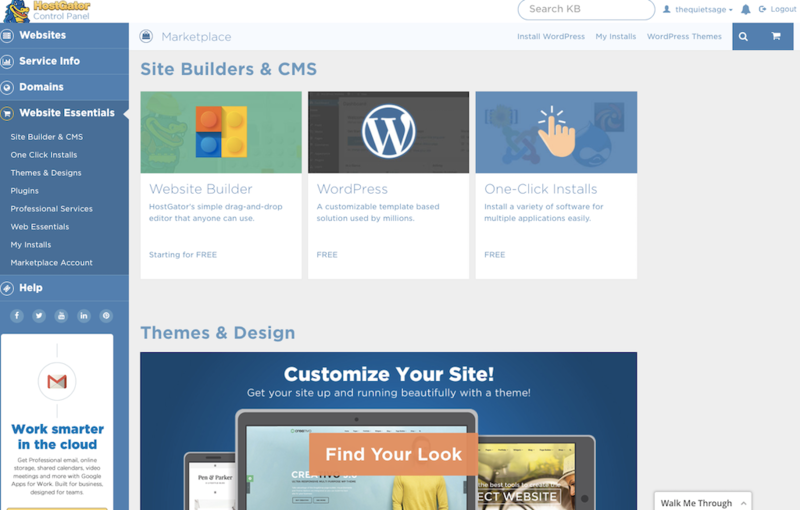 WordPress offers a number of free themes that you can use to customize your new website. For the most part, these themes are set up to be mainly blogs and not full business websites. You may be able to customize some of them enough to get a full website out of it – with full width pages, etc. If you’re looking for a more polished look and feel for your health blog, you may consider purchasing a premium WordPress theme. There are plenty of places to buy WordPress themes online, and I have personally used Elegant Themes and Theme Forest. My two current websites are run using the Divi theme from Elegant Themes. I love it, because it is super simple and sleek. Plus you can customize it to your hearts content if you want to. One of my websites uses the Divi theme on its own, while this website uses whats called a child theme that builds in a more fancy look and feel to the Divi theme. I use the Flourish child theme. This may all sounds a little confusing, but you can get a sense for the difference in how my two sites feel by looking here and here. You can see one site is a lot more designed than the other – and thats what that extra child theme adds to it. If you’re interested in the Divi theme, you can preview and test drive the theme right here. If you’re interested in child themes of the Divi theme like this one, you can preview and test drive a few right here. If you decide to use a premium WordPress theme, you can easily configure it by following the how-to guide and resources the creator has put together. Its honestly as simple as following a set of directions! 5. Customize your theme and add your main pages. Many themes come with main pages already added to them, but if not, be sure you’re adding at least these five key pages to your brand new website for your online business. Homepage. This is where someone will get a first impression of you and your business. About. This is where people can learn about you, your business, and what your major message and mission are. Blog (or other place people can find your free content). This is where people can come back regularly to find whats new and free from you. Work with me, products or offers page. This is where people can find out what you have available and how they can learn from you and work with you. A shop or affiliate links are great here. Newsletter or free course signup (opt in page). This is where you can capture email addresses so that you can follow up with the person later and share more about what you write about and make one-on-one connections. Make your blogan extension of who you are. Allow people to see what you do and why you’re passionate about helping others. Don’t get caught up in making your website or blog perfect right away. Done is better than perfect! And you can always make upgrades as you grow your business over time. Stay consistent with providing free content – and show up regularly for your audience. Seriously, it’s not enough just to throw a few pages or blog posts on a website. You have to give people a reason to get to know you, like you, and trust you enough to stick around and want to continue reading and learning from you. If you use stock photography, make sure it’s ethical. Meaning you properly source your photos AND cite them if necessary. Taking your own photos is the easiest way to get around any issues. Have fun and be yourself! People take note when you take yourself too seriously, so have a good time and run your blog the way you’d love to experience someone else’s. If you really want to take the next step in growing your health blog, build your email list from day one! I use ConvertKit as my email marketing provider and cant say enough great things about it! ConvertKit is easy to configure and set up, and you get unlimited forms, email sends and automation functionality. The automation functionality and ability to segment subscribers was enough to get me to jump on board with their service from the moment I heard about them. I can easily send out my blog posts week after week by setting them up ONCE – and know that every person who signs up for my free content will receive them. It’s amazing! Plus you can share amazing free valuable content like email courses and content upgrades (like PDFs, ebooks, etc) all using their service. It’s easy to get started – click here to create your account! Note: I am a proud HostGator, Elegant Themes and ConvertKit affiliate and have been a happy customer of each one of these services. If you happen topurchase one of the packages from any of these services, I may receive a percentage of the sale. I only recommend services I have used and trust!